These tasty imported sandwich spreads add a whole new world of flavor to your favorite meals! 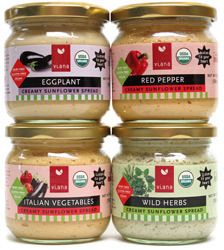 Made with a base of organic sunflower seeds and organic, gluten-free ingredients, these creamy spreads are delicious as a sandwich topping, an appetizer pate, or as a perfect dip for your favorite raw veggies. Available in Red Pepper and Wild Herbs. All flavors are 6.35 oz. and $3.69 each. From Anonymous of NYC, New York on 9/3/2017 . From Leeza of New York, New York on 1/24/2017 . This time, we ordered (just) the Red Pepper spread because we could still taste that wonderful fresh red-pepper taste on the palate! As soon as it arrived, we regretted not getting the whole bunch! For a sandwich or wrap, dipping or scooping, stirred into pasta, or plopped on top of a hot baked potato, these are smashing! Yep -- A five-star rating then, and a five-star rating now. Viana is, as a matter of fact, always top notch! From Leeza of New York, New York on 9/19/2016 . These are fabulous! You will use them on sandwiches, wraps and other places which you will devise when you fall in love with them. A word about the red pepper spread: you actually taste fresh red bell peppers! It is astonishing and a delight to the palate, the way this spread captures the best of the red bell pepper. We love them all and use them with abandon! From Anonymous of L.A., California on 5/24/2015 . I got the Red Pepper one for my boyfriend, along with a ton of other stuff. He got it three days ago, and can't stop going on about how good it is! He says you at first can taste the sunflower seeds in there, and that the aftertaste is divine. From Kelley B. of Milwaukee, Wisconsin on 2/14/2015 . I placed an order with Vegan Essentials about a year ago and they slipped in this sunflower spread as an extra - honestly, I wouldn't have tried it otherwise. But I am SO glad that they did because it is one of the best tasting spreads I have ever had and has become a staple in my household. I've tried a couple of different flavors and they are all excellent. I spread it on crackers and snack on it - especially after a long day or when you just need a little bite of something substantial and savory to keep on going. HIGHLY recommended.